Dr. Alix Carter, Medical Director of Research at EHS Nova Scotia and Director, Division of EMS in the Department of Emergency Medicine at Dalhousie University. The Canadian Partnership Against Cancer (the Partnership) and the Canadian Foundation for Healthcare Improvement (CFHI) today announced that Canadians living with cancer and other life-limiting conditions will gain access to urgent palliative care when they need it, and where they want it. 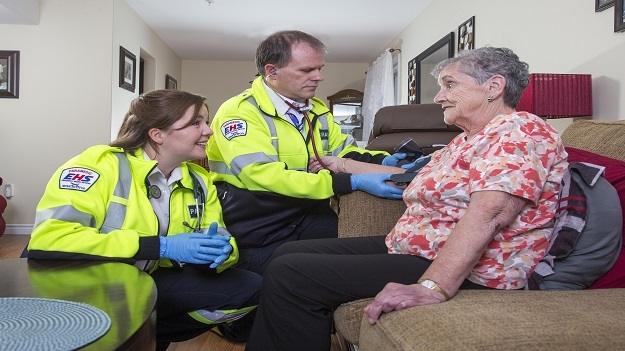 This will be achieved through paramedics trained in providing palliative and end-of-life care in the home, in collaboration with other health professionals. “Introducing this model of care in Nova Scotia and Prince Edward Island has improved access to palliative care 24 hours a day, 7 days a week across our two provinces. Paramedics feel this is some of the most rewarding work they do, and patients and families describe the relief they feel being more able to remain home with the support of this new program,” said Dr. Alix Carter, Medical Director of Research at EHS Nova Scotia and Director, Division of EMS in the Department of Emergency Medicine at Dalhousie University. Evidence shows that having paramedics provide palliative care and end-of-life care in the home improves comfort and quality of life for people with debilitating illnesses, as well as their families.1 It also reduces the number of avoidable trips to the hospital and the use of health system resources, such as hospital beds and emergency departments and total time on a call for paramedics.